Sometimes it’s best to take a back seat, and let your digits do all the talking. There’s no denying that this celebratory balloon nail art will take center stage as you usher in the New Year. 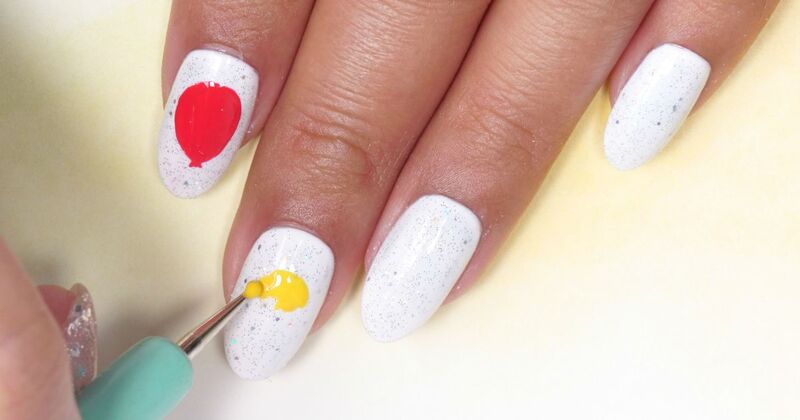 Grab a few colorful polishes, and let the cheerful video below inspire your next manicure. If you’re worried bright polishes will clash with your outfit, try choosing two or three hues that correspond with your final look. However, if you’re feeling bold, you can add gold-toned gems to your nails since the color plays an essential part in most New Year's celebratory décor. Gold is also synonymous with wealth, so it could serve as an indication of future prosperity. 1. Prep your nails with a white gel nail polish, and add a coating of glitter gel polish on top. Cure with a UV or LED lamp between each application. 2. Grab the black gel polish, and use the dotting tool to draw a balloon shape on your thumb. 3. Use the striping brush to delineate the lip of the balloon. 4. Repeat steps two and three on the rest of your nails with the red, yellow, blue and purple gel polishes. 5. Top off each balloon design with the clear base coat. 6. Apply the black metallic foil on the nail with the black balloon. 7. Repeat the step above on the remaining nails using the red, gold, blue and purple metallic foils. 8. 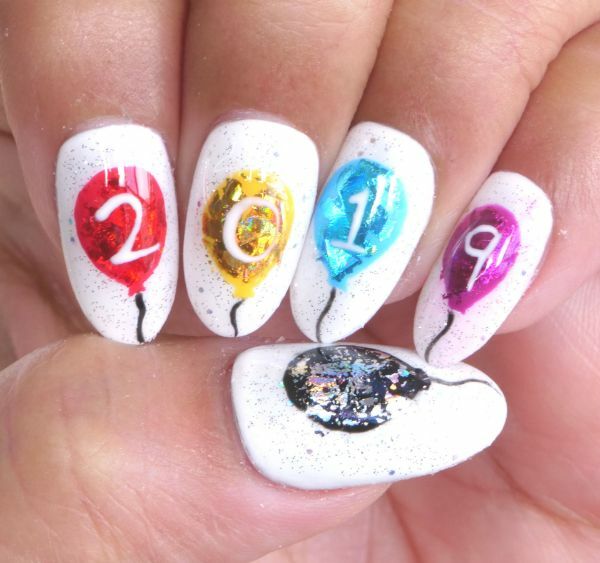 Use the white gel polish to write the year 2019 on four of your nails. Display one number per nail. 9. Use the black gel polish to draw strings on each balloon.